In 1906, the young nation of Australia became a colonial administrator when it assumed responsibility for the external territory of Papua — the southern half of what is now Papua New Guinea. Australia saw the administration of the territory as an opportunity to secure its borders, expand its commercial and colonial interests and prove itself as a mature and modern nation. His Majesty’s Government send hearty congratulations to the Commonwealth on the assumption of full responsibility for the government of Papua. On 7 February 1883, the Sydney Morning Herald published an article about German intentions to annexe the eastern portion of New Guinea (the western part was already Dutch controlled). Because the island lies only 150 kilometres north of Cape York, the article heightened Australian anxieties about their continent’s vulnerable and sparsely populated northern borders. A month later, the Queensland colonial government pre-emptively annexed eastern New Guinea. Lord Derby, Secretary of State for the Colonies, promptly repudiated the colony’s claim when news reached him in London. Free to act, Germany annexed the north-east part of New Guinea (naming it Kaiser Wilhelmsland), the Bismarck Archipelago (New Britain, New Ireland and associated islands) and other small island groups in 1884. Britain quickly responded by proclaiming the protectorate of British New Guinea (covering south-eastern New Guinea), thus providing a buffer between German territories and the Torres Strait, which was vital to Australian navigation. Administration of the Protectorate was shared between Britain and the colonies of Queensland, New South Wales and Victoria, but in 1906 full control of this area was handed to the Commonwealth of Australia and renamed the Australian Territory of Papua. Shortly after the outbreak of the First World War in 1914, Australian military and naval forces occupied Kaiser Wilhelmsland to prevent it being used as a German naval base. Following the war, the United Nations mandated that German New Guinea come under Australian rule. Both territories, however, were administered separately and retained their own identities. In 1949, the Papua and New Guinea Act brought both territories together under one administration based in Port Moresby. During the 1960s there was growing debate, both in Canberra and Papua New Guinea, about the future role of Australia’s administration. Colonial rule and its marked differentiation between Papua New Guineans and Europeans was being challenged. By November 1973 Papua New Guinea had attained self-government and on 16 September 1975 it was granted independence. A key figure in Australia’s early involvement with Papua New Guinea was Sir Hubert Murray. Appointed Lieutenant-Governor in 1908, Murray remained the head administrator of Papua until his death in 1940. Murray’s administration faced pressure from two opposing camps: those who wished to maximise their profits in the exploitation of Papua’s resources, and those who wished to protect Papuan society from destructive European influences. Murray set about collecting traditional objects representative of the diverse cultures in the territory. In 1913 he established Papua’s anthropology museum and passed legislation aimed at protecting Papuan cultural heritage. For Murray, this was an opportunity to learn more about the local people but also to document cultures that were rapidly changing under the influence of colonialism. Murray collected objects himself while travelling through the territory, employed an official government anthropologist and provided funds to patrol officers for collecting. 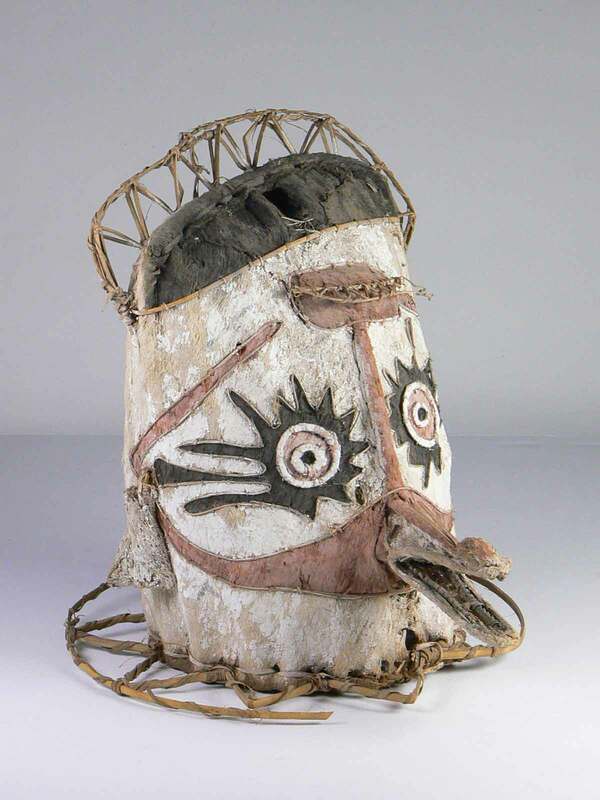 Cylindrical carved wooden drum collected in the Bamu River district of British New Guinea in 1901A cylindrical carved wooden drum with one end in the form of an animal's open mouth and the other end covered in a wallaby skin tympanum. The body is decorated with deeply raised designs painted in white.